Peapod grocery delivery has a different tipping policy than the rest of the grocery services. They deliver your groceries to your home rather than you pick them up so you tip them like you do your pizza delivery person. I believe they do offer pickup in certain areas. They also offer two different kinds of delivery services. Attended – The delivery person leaves the boxes in their delivery truck and carries all the bags of groceries and puts them where you tell them. You must be home for this delivery. Unattended – The delivery person drops boxes (totes) with the bags of groceries in them on your porch. They include dry ice which you do NOT want to touch. You will go back on the website through the “Email Us” link and schedule a tote pick-up of the boxes and ice packs, otherwise, a fee will incur. It’s best to schedule this type of delivery when you will be home within an hour or two to ensure your cold food doesn’t get warm. Peapod has an easy website to navigate. I have never have trouble with it even when they were testing a new design about six months ago (as of Jan. 2017). 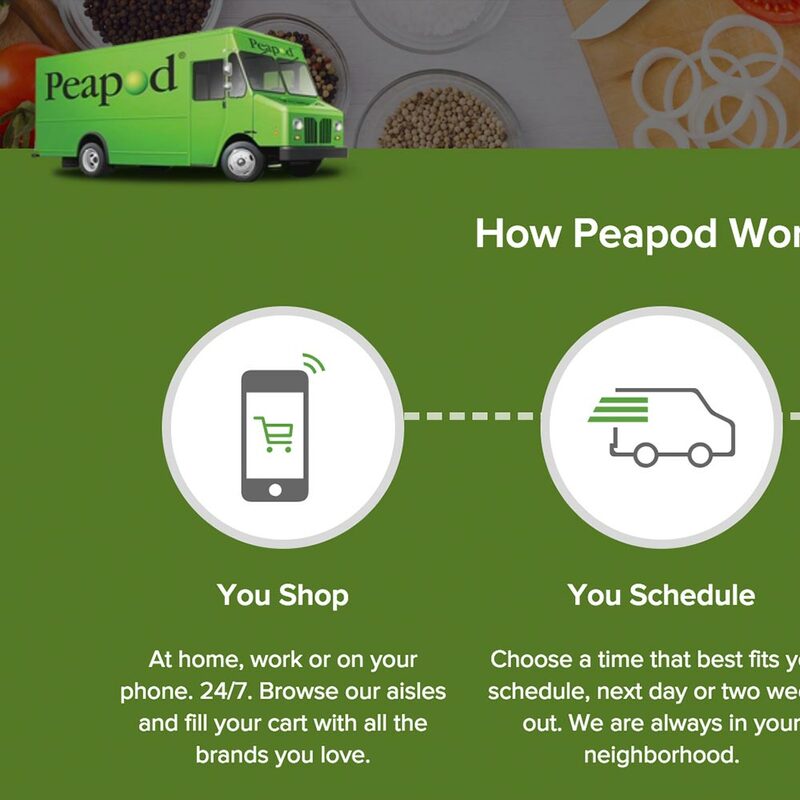 Peapod offers a unique service compared to the others, but the turnaround time is typically two days out and the delivery timeslots are longer (about three hours for attended and five and a half for unattended). One good thing about Peapod’s service is they offer discounts for different days or times. If I happen to have a print coupons and chose an attended delivery, I hand them to the Peapod delivery person and they adjust the transaction before it’s finalized (later that day usually). With an unattended delivery, I place them in an envelope marked PEAPOD COUPONS and tape it to my door so they can clearly see it when dropping off my totes. Peapod doubles valid manufacturer coupons with a face value of 0.99 cents or less, unless otherwise specified on the coupon. Valid manufacturer coupons of $1.00 and over will be redeemed at face value. Peapod will accept internet coupons valued up to $5.00 per item. I have used Peapod many times and there have been three times that I had produce which I was not pleased with. I was reimbursed each time that I contacted them to tell them. Twice, it was a prepackaged salad. The other time was a bunch of banana which had a brown line across them. Perhaps they were dropped on the box during shipment. I have ordered groceries through Peapod about 20 times. On average I have maybe one substitution. You can add comments to your order and turn on or off substitutions in the shopping preferences menu. Shopping for groceries has saved me a ton of time and stress. I have only covered the services available in my area (central Indiana), but if you have any used a grocery service not listed and would like to add your experience to the list drop me a line through the contact form or leave a comment below. I would love to see this list grow and include services everywhere in the United States.